Ben Carson addresses the annual Conservative Political Action Conference at National Harbor, Md., outside Washington, D.C., Feb. 26, 2015. Dr. Ben Carson, retired neurosurgeon and potential GOP presidential candidate, made an Easter Sunday radio appearance on New York’s WBLS. 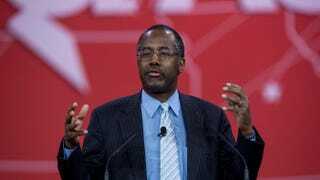 Carson spoke about his political ambitions and said he would make an official announcement in May about whether he will run for president in the 2016 election. In addition to his political commentary, Carson also touched upon music—hip-hop specifically—and the role he said it plays in destroying the black community. According to Business Insider, Carson stated, “We need to re-establish faith in our communities and the values and principles that got us through slavery, that got us through Jim Crow, and segregation and all kinds of horrible things that were heaped upon us. “Why were we able to get through those? Because of our faith, because of our family, because of our values, and as we allow the hip-hop community to destroy those things for us, and as we grasp onto what’s politically correct and not what is correct, we continue to deteriorate,” Carson continued. Carson, who is a devout Christian, was met with opposition from the radio host, who reminded Carson that those exact sentiments were expressed back in the day when people would criticize rock and roll music. Carson then backtracked on his comments to clarify what he meant. “When I talk about the hip-hop community, I’m talking about the aspect of modern society that pretty much dismisses anything that has to do with Jesus Christ; that’s what I’m talking about,” he said. It’s interesting that he’s single-handedly pointing at hip-hop as the culprit that dismisses anything to do with Jesus. Apparently Carson hasn’t heard of Christian hip-hop, or even Kanye West’s song “Jesus Walks.” The hip-hop community is not solely responsible for dismissing Christianity. If he wants to label communities, maybe he should look at the heavy metal community and the electronic-dance-music community. And if Carson wants to take a step back and finger-point even further, the police community seems to be right up there in dismissing Christianity. I seem to remember this one particular commandment that they can’t seem to stop breaking: Thou shall not kill. Despite all the finger-pointing at hip-hop, there are plenty of more important societal ills destroying the community. Hip-hop isn’t one of them. It’s just the easiest target for conservatives.